My very first post on this blog was entitled "Day One on My Own". It captured my sentiments - and trepidations - on the day I launched FamZoo. Well, it's now 365 days later, and it seems that a retrospective post is in order. First and foremost, I have to say that I have absolutely no regrets about taking the entrepreneurial plunge. I should point out that my lack of regret has nothing to do with the opportunity that I walked away from. Elance has been enjoying a solid upswing since I stepped away. (I'm hoping that is not a causal relationship! ;-). The number of projects posted on Elance is up over 50% from last year and the upward trend continues. My no-regrets sentiment has everything to do with my own personal growth. The last year has been an enormous challenge and learning experience for me (those two go hand in hand). Starting a business from scratch as a solo entrepreneur has given me deep, firsthand exposure to an incredibly broad array of business activities. Looking back over a years worth of closed tasks in my project management system, I see everything from developing code to setting up payroll. Here's just a sampling of some of my firsthand experiences culled from 761 closed tasks: starting a blog, buying a domain name, incorporating, securing trademarks, building an internal project management system, setting up web and email hosting, setting up a Wiki-based intranet (using JotSpot), product research and design, lots and lots of coding, early stage funding and capitalization structures, small business banking, logo design, cross-browser Web page design, Ajax development using the Yahoo User Interface library, writing product help material and shooting screencasts (using an iMac, iShowU, GarageBand, and iMovie), deploying QuickBooks Online and establishing accounting procedures, competitive analysis, hiring outsourced accounting and tax help, launching a preview version of the product, developing marketing materials, signing up charter members, providing customer support, setting up a user community, networking and business development, giving demos, pitching venture capitalists, implementing a contact management system (Highrise from 37 Signals), setting up payroll (via the Quickbooks Online Payroll module), setting up a stock option incentive plan, reviewing Terms of Service and Privacy statements, ... you get the flavor. A year later, FamZoo has gone from nothing to a functioning service running in private preview mode for 20 families. 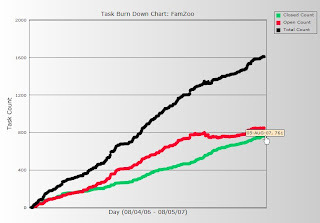 All that said, by far the most important milestone for FamZoo occurred just two weeks ago when my long time friend and colleague, Chris Beaufort, joined the company. 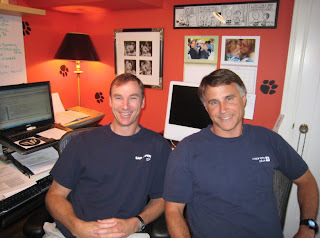 We are pictured at left at the "FamZoo International Headquarters". This is an enormous step forward in the maturation of FamZoo as we begin to emerge from the garage/spare-bedroom phase and move ever closer to becoming a self-sustaining, profitable company. In just these first two weeks, I can already feel the tremendous impact and vibe that collaborating with a compatible, motivated, hands-on teammate brings: ideas and designs are more thoroughly vetted and challenged, key projects move forward in parallel instead of always being serialized, and we touch far more prospects and partners. It is truly invigorating, not to mention fun. I could really use some of that hair back! 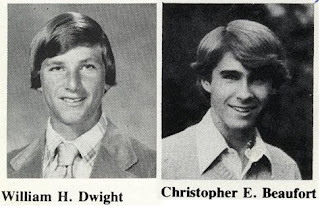 Now I don't mean to slight my co-founding partner Bonzo, but I have to say that Chris is infinitely more productive (with none of the hygenic issues). Nonetheless, even with Chris on board, Bonzo will continue to fulfill his valuable role as loyal companion and symbol of tenacity. Happy birthday FamZoo - looking forward to a fantastic year 2. Happy Anniversary! Nice mug shots. Hopefully the biz fairs better than the hair. Best of luck.